Your firewall should be disabed by now. Your firewall balloon notification should be disabled by now. 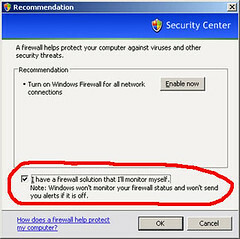 Note: if you do not have your own firewall system, it’s not recommended to disable firewall in window xp. Disable window firewall might let your computer expose to hacker attack. I can’t turn off Windows Firewall in my XP computer…the “off” and “on” are light-grayed out, “on” is selected and “off” will not select. ??? But: when a new person logs into the system for the first time, there is an Alarm/Notification: “Your Computer may be at risk…”. 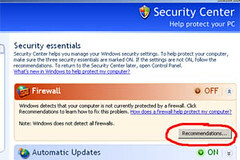 If the new user clicks in quickly he/she can still see the firewall settings page that lets him/her turn it on again. Which will interfere with our applications.